(Los Angeles, Calif.) – There is nothing subtle about the long-bearded rocker Billy Gibbons, lead singer and guitarist for the legendary band ZZ Top. One thing that Billy loves is loud rock n’ roll – and even louder hot rods. ROCKIN ROADSTERS, a new pilot premiering Monday, February 29 at 10 PM ET/PT on Discovery, will follow Billy’s quest to fulfill his wildest hot rod desires. Hot rodding is not just about the cars, it’s a lifestyle. In the pilot episode, Billy reaches out to one of the top hot rod builders in the business – Jimmy Shine. Billy has known Jimmy for more than 20 years and during that time, they’ve built dozens of award-winning hot rods. When they get together, you never know what kind of car will come to life. Billy acts as the creative director, driving the vision and finding the hidden gem vehicles while Jimmy executes and makes sure it all comes together. But it’s a partnership that’s often easier said than done. Together Billy and Jimmy hit the open road in an impromptu search of the perfect fixer-upper. If there is one thing Billy loves, it’s a bargain especially when it comes to cars. After an exhaustive journey into the California desert, Billy finds the unlikely car behind his vision – a rusted and dinged up 1984 El Camino. 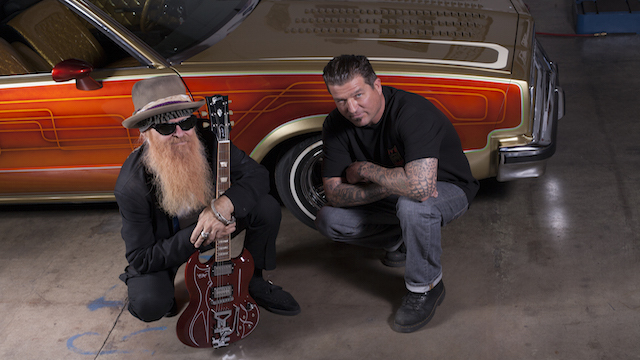 With a rock star client like Billy Gibbons, you need to be ready for anything— even when asked to build a part car/part truck roadster for a big Hollywood event just three weeks away. It’s a tight timeline, but if Jimmy can pull it off, there just might be a bigger-than-normal payoff for this master builder. With Jimmy and his opinionated team of mechanics, it’s all hands on deck as the team scrambles to make deadline and incorporate unconventional parts Billy has collected along the way – including an old bass drum pedal. And of course, no hot rod is complete without a hidden “Billy-ism” built into the car. With so many moving parts, will Jimmy and his crew be able to make Billy’s tight deadline and cash-in on the ambitious build? Or have they reached the end of the road with their celebrity rock star client? ROCKIN ROADSTERS is produced for Discovery Channel by Intuitive Entertainment. For Intuitive Entertainment, Executive Producers are Mechelle Collins and Kevin Dill. Intuitive Entertainment’s Executive in Charge of Production is Tyson Caffo. For Discovery Channel, Craig Coffman is Executive Producer with Todd Lefkowitz as Coordinating Producer. To learn more, go to www.discovery.com, on Facebook at Facebook.com/discovery and on Twitter @Discovery.